Anyway, Daisy and I attended the Feed Your Soul event run by Ashy Bines and Nicole Joy. These are two inspiring young women who had a wonderful, positive message. My favourite guest speaker was Dr Nat Krouglis. Dr Nat runs a women's health and fertility clinic called The Pagoda Tree in Melbourne. I was encouraged by her talk on gut health being the basis for many health problems. She said, "I'm going to keep giving you the same answer to all your questions. If you have health problems, you need to get your gut right." Dr Nat talked about how The Pill, antibiotics and modern-day diets damage or destroy the good bacteria in your gut and how this leads to a multitude of illnesses. I wanted to get up and cheer! :) It was wonderful that these young women were hearing such wisdom about their health. A long time ago, I used to love Fruit n Nut chocolate. :) Really, if you're going to have chocolate, it has to include nuts. Now that chocolate is off the menu, I really appreciate treats like this one. The cacao butter, coconut oil and nut butter give a creamy, chocolatey taste. And the addition of the sultanas and roasted nuts just makes it bliss. Makes - one 20 cm square pan full. Cut into as many pieces as you like. Line a 20cm (8 inch) pan with baking paper. 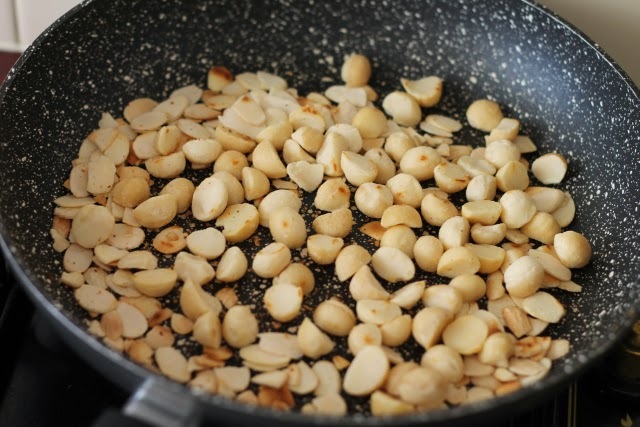 Toast the macadamia nuts in a dry frypan over medium heat. Stir regularly, and remove from heat when lightly browned. Repeat for the flaked almonds. Meanwhile, melt the cacao butter in the microwave (about 2 minutes). Melt the coconut oil (about 30 seconds) in the microwave. In a mixing bowl, stir together the melted cacao butter, coconut oil and nut butter. 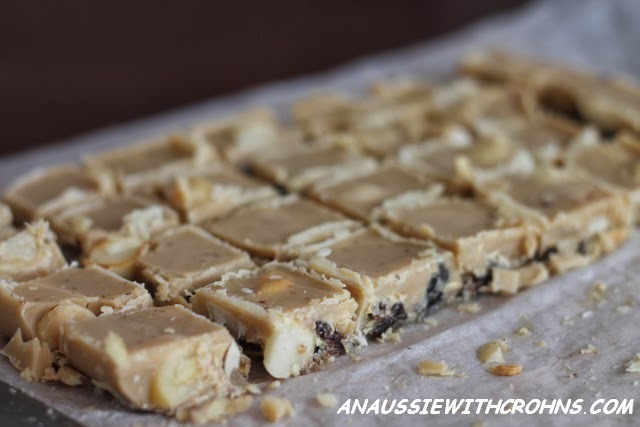 Mix in the honey, vanilla and sultanas. Finally, stir through the toasted nuts. Mix well. 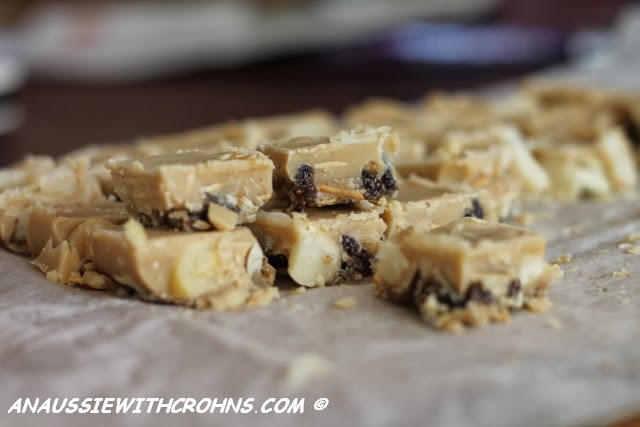 Pour the mixture into the prepared pan, spreading the nuts and sultanas evenly across the bottom. Put in the fridge or freezer to set. When fully set, cut into pieces. I store mine in the freezer. Have you signed up for new recipes via email? You can subscribe in my widget in the top right corner. Thanks to all the people who've come and said Hi on Facebook. It's lovely meeting you all! Have you ever tried making this with maple syrup? Unfortunately the only sweeteners I can have are maple syrup and coconut sugar and would think that a 1 for 1 swap would work. Looks yummy and I plan to try it this weekend. I make this ALL the time! Like every week. It is amazing. I have used maple syrup with great success. 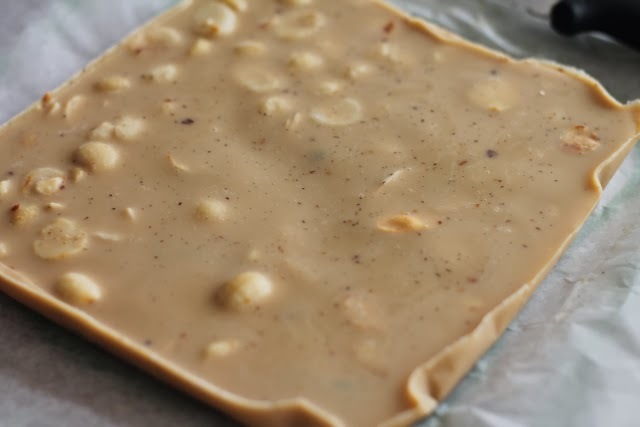 I have also used peanut butter from the store and almond butter made at home. It is always good. I reduce the amount of cacao butter a little as I find the taste overwhelming. Thank you thank you thank you for sharing this. I tell everyone about it! Tell me, please, "1/2 Cup nut butter" - what oil did you use? Item 8 - you nuts stirred in a blender? Thank you!